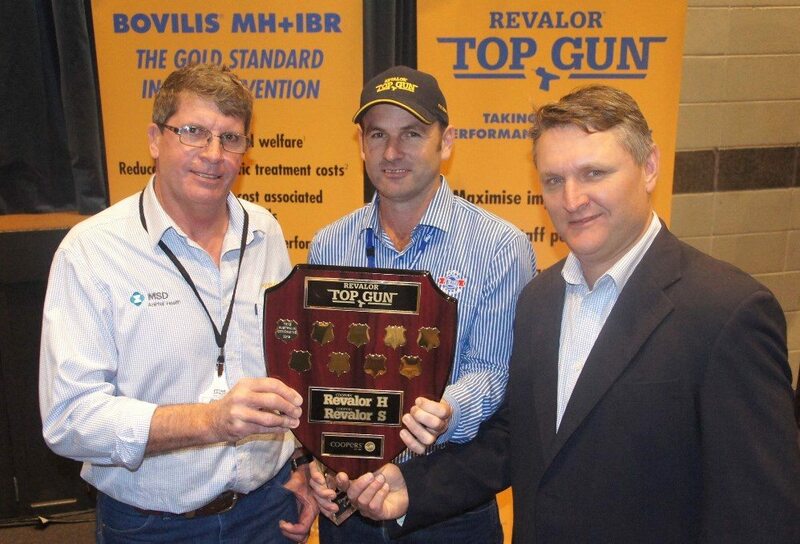 Teys Condamine feedlot manager, Carl Greaves receives the Top Gun perpetual shield from Coopers feedlot manager Brett Kowitz and national account manager Rob Baines. THE economic and welfare benefit of correct HGP implant procedure was highlighted in an important feedlot award presented during the Beefworks conference in Toowoomba last week. Coopers Animal Health last year introduced its Revalor Top Gun program, designed to acknowledge feedlots for excellence in HGP implant technique at induction. The competition audits HGP implant performance and importantly, offers feedlots an industry benchmark to compare their own performance against, while rewarding those induction teams that delivery consistent and industry-leading results over a 12-month cycle. This year, the competition attracted 20 feedlots of different sizes across Australia, representing a total one-time feeding capacity of around 250,000 head. Entry involved eight audits of HGP performance over a yearly cycle. Scores were based on implant retention, any evidence of abscesses, hygiene practises and implant technique. “The award is designed to reward and acknowledge feedlot induction staff – people who work hard and are not often recognised for the work they do,” Coopers national account manager Rob Baines told last week’s BeefWorks delegates. “Feedlot performance is directly affected by their quality of workmanship and attention to detail. HGP implant performance can be a major profit driver in the feedlot sector, and the Top Gun program aims to monitor, help improve, and reward those people who most impact on a yard’s implant performance,” Mr Baines said. The overall combined average retention rate across all 20 yards involved in this year’s Top Gun competition was 94.5 percent. The message is that some basic training and the use of simple procedures, including good hygiene practices, can lift the implant retention performance considerably. 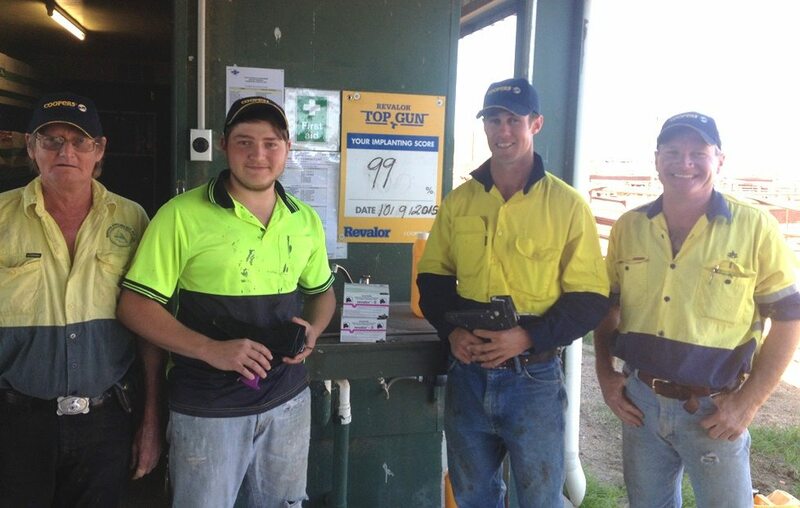 This year’s Top Gun winner was Teys Australia’s Miamba feedlot near Condamine on Queensland’s Darling Downs, which recorded an implant retention rate across the entire year of 99.3 percent – an unbelievable result, given the yard’s annual stock turnover of around 90,000 head. Teys Condamine’s induction crew, from left Tony Pain, Lawson Pain, Dean Warren and Tony Ryan. In several of its quarterly results, Teys Condamine recorded good implant rates of 100pc. A number of other yards recorded excellent implant retentions of 98-99pc or higher. “The real importance in this competition is not just about encouraging those guys doing a great job in maintaining already high retention rates, but also about improving the performance of those towards the bottom, and that’s what’s been achieved,” Mr Baines said. “As a result of mentoring and training, the bottom group actually lifted their performance more than 25 percent over 12 months, which is an exceptional effort, and three feedlots had double-digit improvement over the four calendar quarters,” he said. “Looking at the kilograms of beef involved in the improved implant retention, the group average lifted by 2.5 percent. That represented an extra 20,000 kilograms of beef produced. It’s highlighted how important this was,” he said. Teys Condamine now gets to proudly hang the Coopers Top Gun perpetual shield in the feedlot office for the next 12 months, and feedlot induction team receives individual prizes from Coopers/MSD Animal Health. The 2016 Top Gun competition, likely to be expanded into a more ‘holistic’ induction assessment, is already open for entries. 20,000kg is a lot of beef, especially at today’s prices. It’s worth trying to maximise implant performance in those pens where they are used.